WE HAVE BEEN ORACLE PLATINUM PARTNER FOR 9 CONSECUTIVE YEARS! It is not easy to achieve levels of excellence and neither is it easy to keep them over time. We are proud of having succeeded and of being able to boast a long partnership with Oracle, who also this year has recognized us, for the ninth time, as Platinum Partner. The commitment, dedication and professionalism of Alfa Sistemi have been repaid in the best of ways: we are one of the few Italian companies to have achieved this result that allows us to always be up to date on a wide range of Oracle applications and technology products. 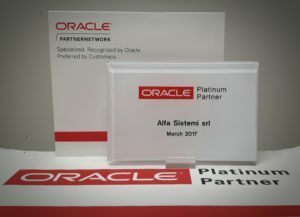 Being an Oracle Platinum Partner gives us the opportunity to constantly improve, offering more and more efficient solutions to meet the different needs of our customers. This is important to us, to have satisfied customers to accompany along their path and the development of their business. So we cannot but be proud of what we are and what we are doing, a team that is united and cohesive, with the continued pursuit of excellence and able to offer the best ICT solutions, in compliance with the high quality standards required by Oracle, with the sole purpose to improve the level of satisfaction of our customers.